“Collectionzz proudly announces Art Unleashed: Rock Art for a Cause, a collaboration with many extraordinary artists from around the world, with two goals. Our first goal is to raise money for charity, and we will be donating all profits from the sales of the art to the charities of the artists’ choices. Our second goal is to exclusively bring to our members some of the most phenomenal rock art they’ve ever seen! On sale Thursday, May 17th at 2pm Eastern (11am PDT) HERE. There are two different editions of “For The Birds, From Below”. The main edition is printed on coventry rag with hand deckled edges, and is signed and numbered out of 150 and is $75.00. 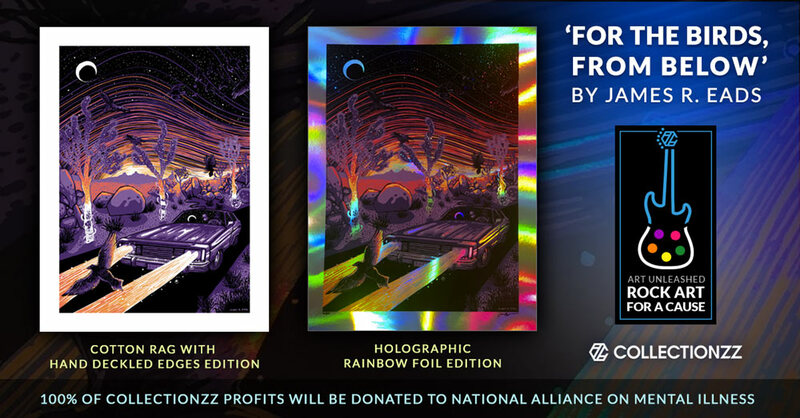 The variant edition is printed on holographic rainbow foil, and is signed and numbered out of 50 and is $100.00. They also have 20 out of the 50 variant editions that have been remarqued by James that are $125.00 each. This entry was posted in Art Prints and tagged James R Eads, Red Hot Chili Peppers, Scar Tissue by admin. Bookmark the permalink.